In one of the biggest 4G launches till date, Bharti Airtel today announced that they have made commercial launch of its high speed 4G services (also called LTE) in 296 towns across India. Airtel had been testing its 4G services in few major cities in India till now. 4G connectivity will be available to customers across a range of smart devices including mobile phones, dongles, 4G hotspots and Wi-Fi dongles. Airtel 4G services were first launched in the country on trial basis in April 2012, with Kolkata being the first city to get such high speed data. 14 cities besides Kolkata have Airtel 4G network at present- Bengaluru, Pune, Nagpur, Nasik, Jalandhar, Hoshiarpur, Kapurthala, Phagwara, Patiala, Amritsar, Ludhiana, Chandigarh, Panchkula and Mohali. With launch in 296 towns across India, Airtel 4G is now available in 310 Indian town and cities. 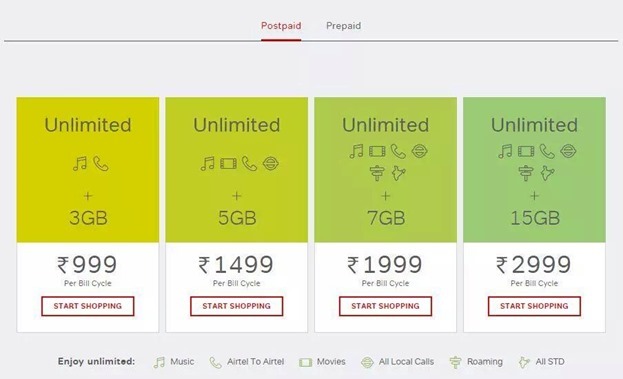 Along with this launch, Airtel has now introduced a new range of ‘Infinity Plans’ that will offer unlimited voice calls on mobile, along with bundled movies and music. Airtel also announced launch of ‘Wynk Movies’, a mobile application that offers mobile users thousands of movies and other video content. The app can be downloaded by users from any network, as the app is carrier agnostic. Airtel also announced a new platform called Flexpage that will allow customers to track their data usage and get real time usage alerts. Going forward, new customers can now order home delivery of SIM card, which will be at their door step in less than 4 hours. According to the press release, Airtel customers can enjoy 4G at 3G data prices with packs starting at INR 25. In addition, with every 4G SIM swap, Airtel is offering six months of unlimited music streaming and downloads on ‘Wynk Music’ and five free movies per month for six months on the Eros Now channel of ‘Wynk Movies’. The newly introduced ‘Infinity Plans’ will start at Rs.999. These high-end plans offer unlimited voice calls on mobile (first time in India) along with data benefits and access to ‘Wynk Movies’ and ‘Wynk Music’. Few days back, Airtel had vehemently claimed that they will be launching Pan-India 4G services before Reliance Jio and with this launch they have kept up that promise. It was widely believed that they will launch the services in 44 cities, however, with commercial launch in 296 cities, they have gone beyond general expectation. Interestingly, many believed that Airtel will be launching their own branded 4G handsets, but the announcement does not confirm any of those rumours. Reliance Jio on their part have said that they will be launching their much talked about 4G services by December of this year. They are undoubtedly going to give Airtel a tough time due to their rumoured cost-effective 4G plans. We will need to wait and watch. It is now safe to say that 4G revolution has official got a kick-start in India! "Airtel 4G LTE Services Launched In 296 Towns Across India", 3 out of 5 based on 4 ratings. Jio Effect: Airtel offers 15GB 4G Data at 1GB Price; Is There a Catch? I would like extend my support for successfully completing the installation of Towers in various places of Assam by offering required quantity of land as per your company norms of hiring the space for towers or offices in Assam. Kindly feel free to contact 7578010096.
how much time to take airtel for 4g services at up east. when we are getting 4g at siliguri?